Q. What is the "Boater Education Card"? A. The Boater Education Card is proof of competency of the basic rules of the water that all boaters should know. Q. Do I have to get the Boater Education Card? A. In Alaska, boater education is not a requirement but doing so will allow you to test you skills to be a better and safer boater. Also, you may be eligible for a savings on marine insurance for having your Boater Education Card. Q. How do I get my Boater Education Card? For a complete overview of the online boating exam process, please visit our Online Exam Process overview page. Q. What if I don't pass the Alaska Boater Exam? A. No problem. At BOATERexam.com®, we have a hassle free refund policy. There is no cost to retry the exam if you do not pass. You will receive your score and be allowed to review any of your wrong answers. You can then review the course material and take the exam again at no cost to you. A. The cost of the exam is $29.95. 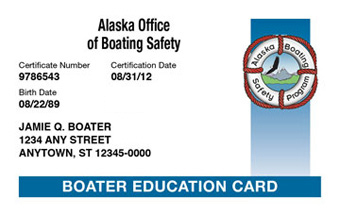 There is no cost to get your Boater Education Card which will be mailed to you home within 3-5 weeks.